Tarneeb - thanoscardgamess jimdo page! This is a plain trick taking game with bidding which is popular in Egypt, Lebanon and in other places of the Middle East. You can play both the Egyptian and the Lebanese variant. There are four players in partnerships of two and a standard 52 card pack is used, each suit ranking in the usual way from ace (high) down to two (low). A bid in the Egyptian variant consists of a number of tricks above six (from 1 to 7) and a suit or "no trumps", while in Lebanese variant it is only the number of anticipated tricks. At your turn you can either pass or bid higher than the previous bidder. When a bid is followed by four passes, the last (and highest) bidder becomes the declarer. In Egyptian game, the trump suit (if any) for the hand is determined by the declarer's final bid. In the Lebanese variant, the declarer announces the trumps. The declarer's site must achieve at least the number of tricks bidded. The declarer leads to the first trick. 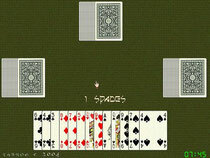 Players must follow suit if they can; a player who has no cards of the suit led can play any card. A trick is won by the highest trump in it, if any. If there are no trumps in the trick, the highest card of the suit led wins it. The winner of a trick leads to the next.